Transformers! They're the stuff of childhood dreams. And thanks to some enterprising folks in Japan, we're one step closer to having them be a reality. 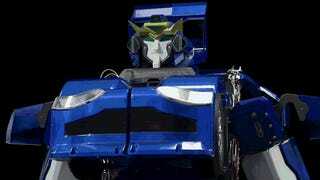 You're looking at J-deite Quarter, a 1.3-meter-tall transforming robot made by Brave Robotics, Tomy and Asratec. It's step one in a 3-step goal of creating a 5-meter-tall, life-sized and transforming robot by 2020. They're slated to have the intermediary robot, J-deite half, done by 2016. For more info and to look at this little guy in full, check out the creator's site.